What came first? The bunny or the egg? Who cares. 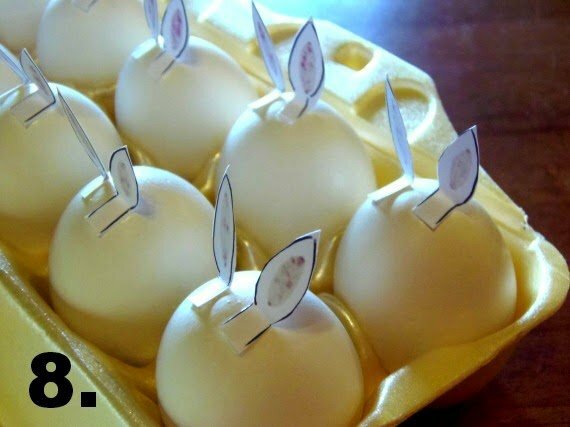 These Hard Boiled Bunny Eggs are so cute, they’ll be a sure hit with the kids this Easter and they’re super easy to make. I’ll show you how. 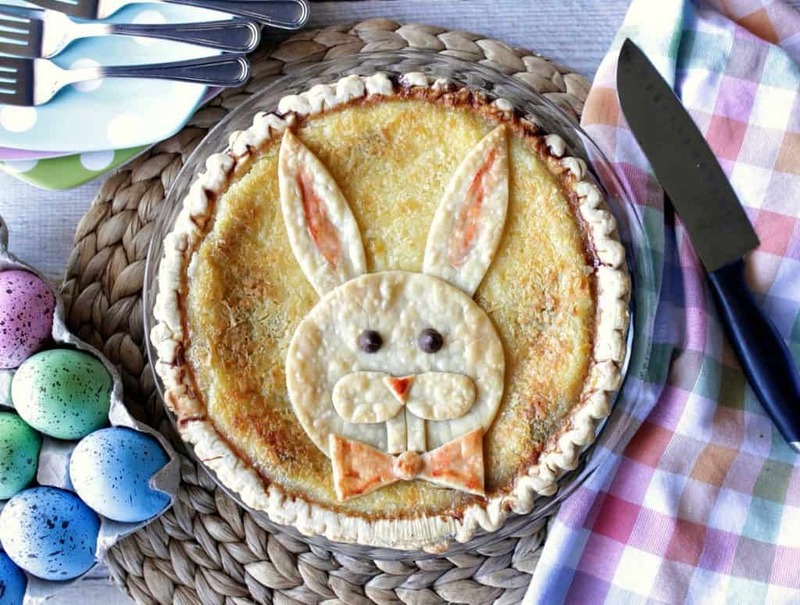 Today is the first full day of spring, and some bunny (me) is ready to celebrate by showing you how to make these adorable Hard Boiled Bunny Eggs. They’re super easy to make and you probably have everything you need to make them already in your home. 1. Hard boil and completely cool the eggs. 2. 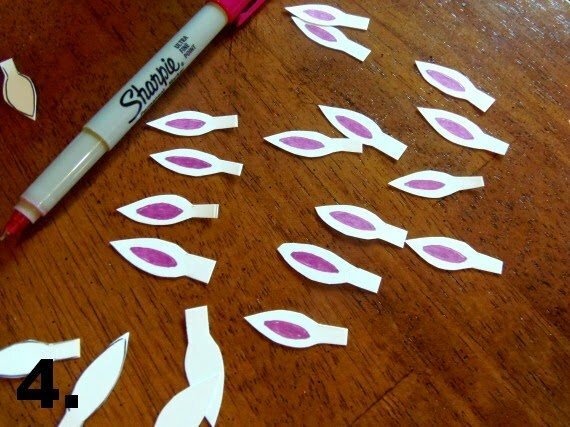 Draw out 24 bunny ear shapes on the card stock, making sure to add fold tabs to the bottom of each ear. 3. 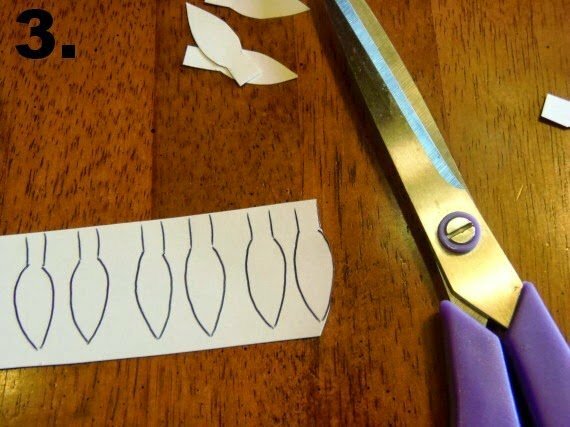 Use the scissors to cut out each ear, including the fold tab. *Note – this is easiest to do if you trim the card stock to a smaller size. 4. 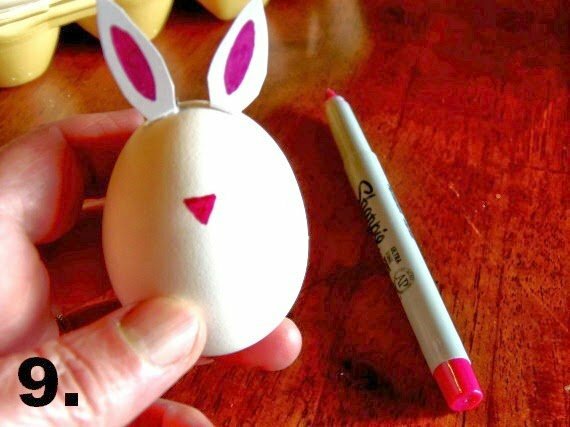 On the opposite side of where you drew your ear shapes, use the pink marker to color in the inside of the bunny’s ear. Do this for all 24 ears. 5. Fold the tab on the ears backwards from where you colored in with the pink marker. 6. Place a tiny dab of white glue on the bottom of the ear tab. 7. Press each ear firmly in place on the top of the pointy end of each bunny egg. 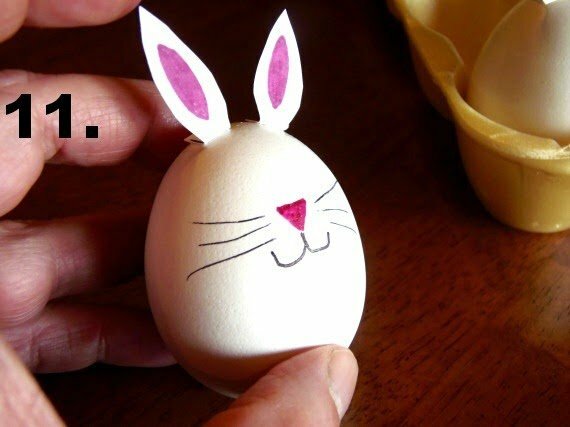 Continue the same process with all the eggs until each one has two ears. 8. Make sure the bunny ears are facing forward and the tabs are in the back of the bunny and do not show. 9. Using the pink marker, draw a tiny upside down triangle for the nose of the bunny. 10. Use the black marker to draw on the mouth. 11. Use the black marker to draw on the whiskers. 12. Use the black marker to draw in the eyes. 13. 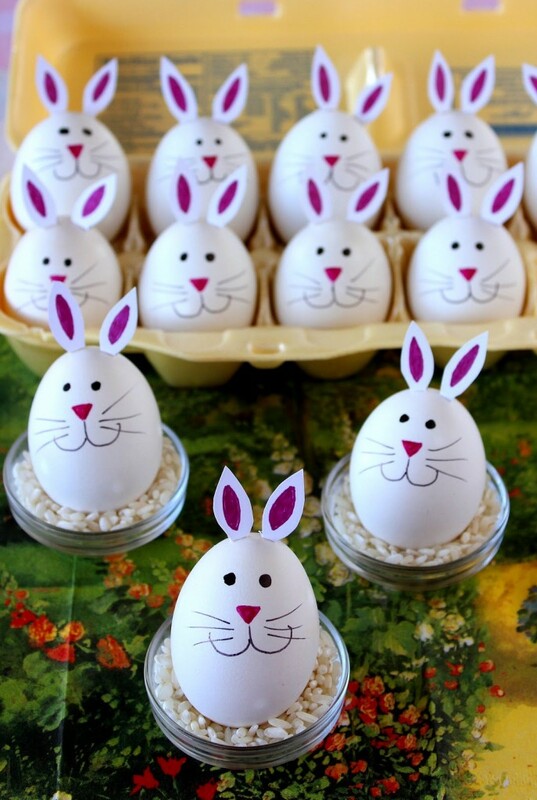 If you plan on displaying your bunny eggs in the carton they came in, add about 1 tablespoon of rice into the back compartments so they’re lifted up a bit higher than the bunny eggs in the front row. 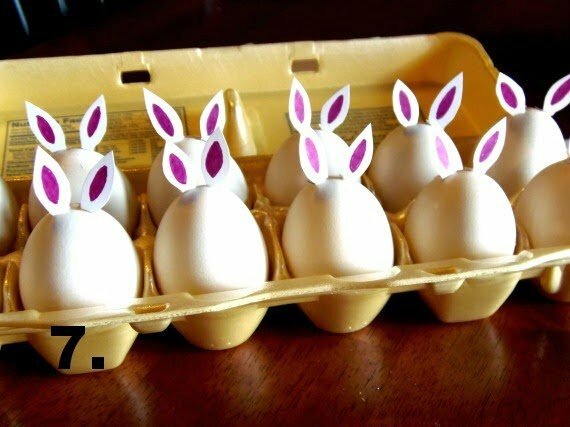 *Note – you can also use this method to display the bunny eggs in a another style of holder to keep them standing straight. 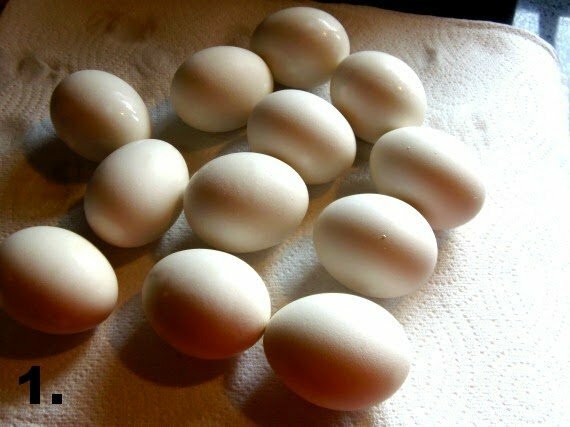 Prepare the hard boiled eggs and allow to cool. 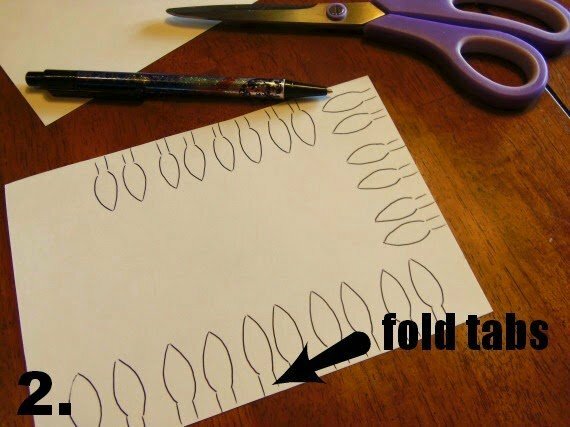 Use the card stock to draw and cut out 24 ears, making sure to leave a fold-tab at the base of each ear. 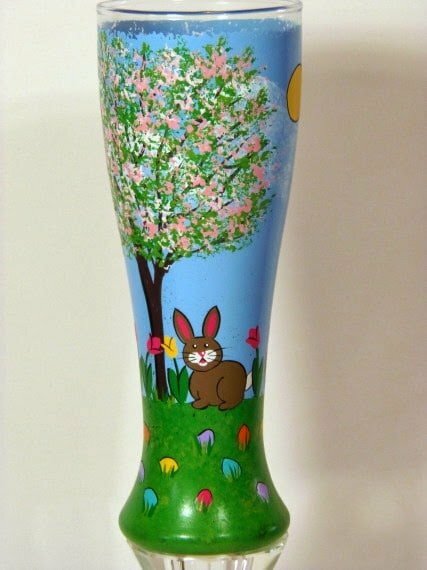 Color the inside of each bunny ear with pink. 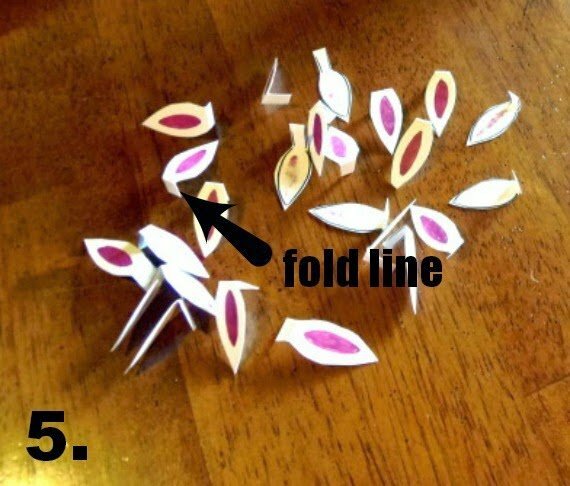 Fold each ear to leave a tab for gluing. 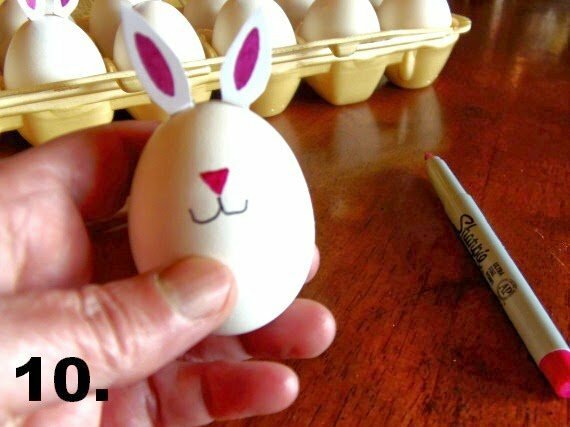 Attach two ears to each hard boiled bunny eggs. Like this. Allow to dry. 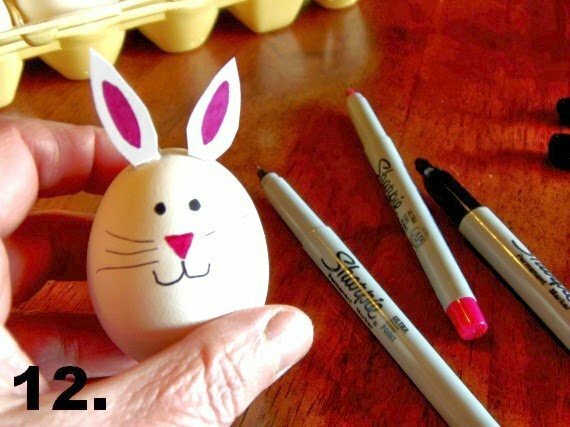 Use a pink marker to lightly draw a triangle bunny nose (food safe markers work best). Draw on a simple bunny mouth. 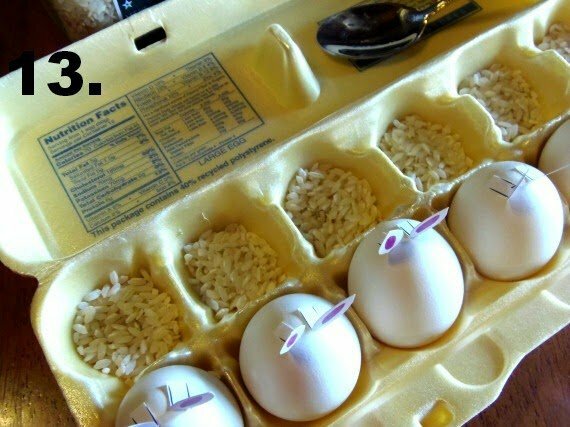 Add rice to the bottom of the egg carton to keep the hard boiled bunny eggs standing tall. 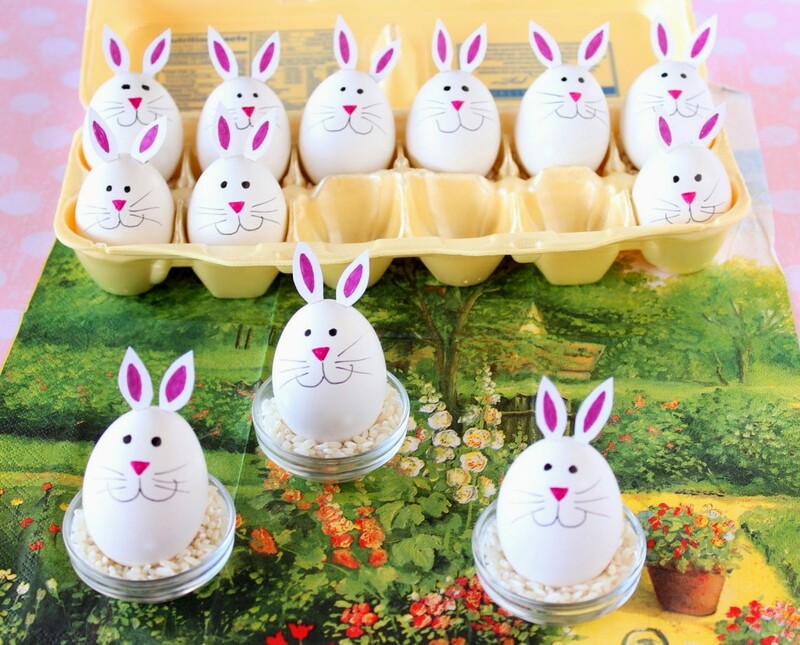 Super Charming Hard Boiled Bunny Eggs for Easter. If there is ever anything I can paint for you, please contact me or visit my shop which is located within the navigation bar. Custom orders are always welcome and I can work from any photo or description you send my way. I’m happily linking up this post with The Chicken Chick and her clever chicks blog hop. Thank you so very much!!! 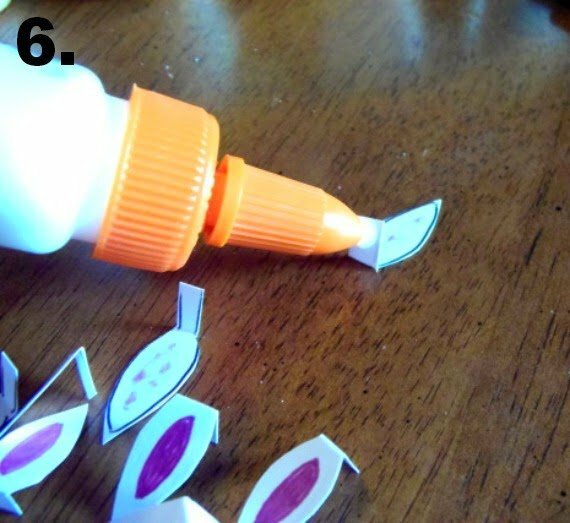 Such a cute and easy Easter craft for the kids! 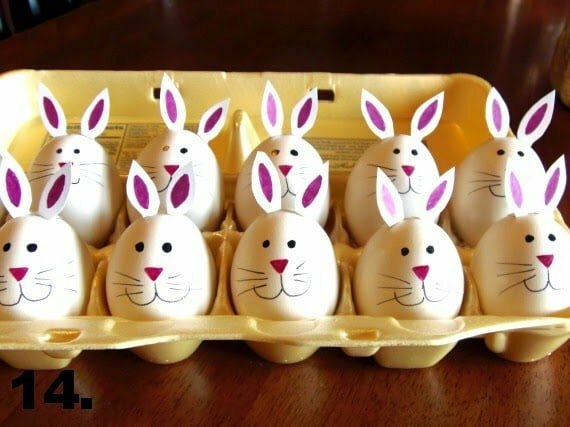 Love your tutorial on the Bunny Eggs…….they are just adorable. Thank you for sharing with the Clever Chicks Blog Hop! I hope you’ll join us again next week! Oh my goodness, these are adorable! My kids would love these! Very cute little egg bunnies. These are such a cute and fun idea! So easy too! These are just the cutest little eggs! I have a feeling my boys would love to make these with me.